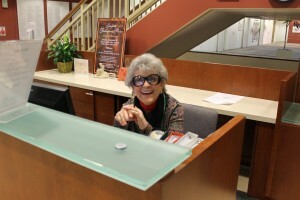 In Glenview, our three reception desks are staffed by volunteers. Their duties vary in scope and schedule, but all reception volunteers are asked to greet and direct visitors, provide assistance and direction for visitor appointments, meetings, and deliveries and act as a communication liaison with staff. They are our front desk ambassadors. At the present time, we have several shifts available and we can always use reception “subs” when our regular volunteers cannot be at their post. If you are interested in becoming a reception volunteer in Glenview, please contact Debra Mell at (847) 556-1568) or dmell@carecenter.org Some training is required. Shifts are 3-hours in length.